Green and bio solvents are majorly derived from agricultural sources such as corn, sugarcane, lactic acid, refined glycerin, bio succinic acid, soybean oil and similar others. Eco-friendly nature and low volatile organic compound (VOC) content emission than conventional petroleum based solvent were the prime reason for manufacturers to shift towards green solvent. Furthermore, the consumption of green and bio solvents are projected to display a tremendous growth owing to the rising concern of health and hygiene among household consumers’ and institutional workers. The global green and bio solvents market is expected to grow at a CAGR of 7.45% between 2018 and 2024 in terms of value and 4.90% in terms of volume. 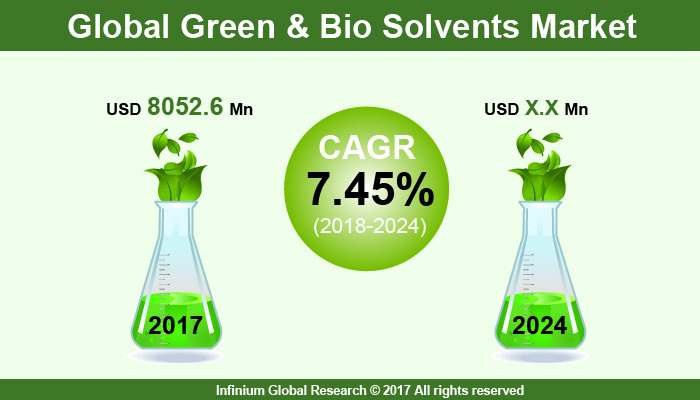 The global market size of green/bio solvents was worth USD 8052.6 million and it is projected to reach to USD 13272.7 million in 2024. In terms of volume, it is projected to reach to 4029.2 kilo tons in 2024 expanding from 2902.1 kilo tons in 2017. The growth in this market is primarily driven by factors such as increased demand for green solvents across end use application areas such as paints and coating and industrial cleaning applications among others. The green/bio solvents are increasingly used in paints and coating across constructions, manufacturing, automotive and marine among others applications. Moreover, the environmental issues associated with synthetic solvents and favourable government regulations for the use of green solvents across application industries are likely to augment the growth in this market over the forecast period. On the other hand, the high cost associated with the manufacturing of these solvents is likely to restrain the growth in this market over the forecast period. The fluctuations in the crude oil prices and instability in the prices of synthetic solvents is likely to provide the opportunities for the companies operating in the green/bio solvents market over the forecast period. Moreover, the global trend of shifting from synthetic chemicals to bio-based chemicals is one of the crucial factors affecting the growth in this market. Regulations such as REACH have affected the consumption of the chemicals that are harmful to human health and to the environment; this in turn is likely to pave avenues for the manufacturing of the green/bio solvents over the next six years. The report on global green & bio solvents market covers segments such as, type and application. On the basis of type the global green & bio solvents market is categorized into bio-alcohols, dio-glucols, bio-diols, lactate esters, d-limonene, methyl soyate and others. On the basis of application the global green & bio solvents market is categorized into industrial & domestic cleaners, paints & coatings, adhesives, printing inks, pharmaceuticals, cosmetics and other applications. Among the geographies, North America dominated green & bio solvents market followed by Europe. Increasing environmental awareness among consumers, Research and development for advanced products by manufacturers and research laboratories to develop cost-effective and eco-friendly solvents drive the North America region. The U.S. is the leading consumer of green solvent products in the North America. While RoW region (which includes Latin America, Middle East & Africa) is anticipated to grow at a highest CAGR in terms of value and Asia-Pacific is set to grow at a highest CAGR in terms of volume over the forecast period. The report provides profiles of the companies in the global green & bio solvents market such as, Archer Daniels Midland Company, BASF SE, bioamber inc., huntsman corporation, E.I. Dupont de nemours & co., The dow chemical company, vertec biosolvents inc., florida chemicals company inc, cargill inc. and cremer oleo gmbh & co.. The report provides deep insights on demand forecasts, market trends and micro and macro indicators. In addition, this report provides insights on the factors that are driving and restraining the global green & bio solvents market. Moreover, IGR-Growth Matrix analysis given in the report brings an insight on the investment areas that existing or new market players can consider. The report provides insights into the market using analytical tools such as Porter's five forces analysis and DRO analysis of green & bio solvents market. Moreover, the study highlights current market trends and provides forecast from 2018-2024. We also have highlighted future trends in the green & bio solvents market that will impact the demand during the forecast period. Moreover, the competitive analysis given in each regional market brings an insight on the market share of the leading players. This report will help manufacturers, suppliers and distributors of the green & bio solvents market to understand the present and future trends in this market and formulate their strategies accordingly.